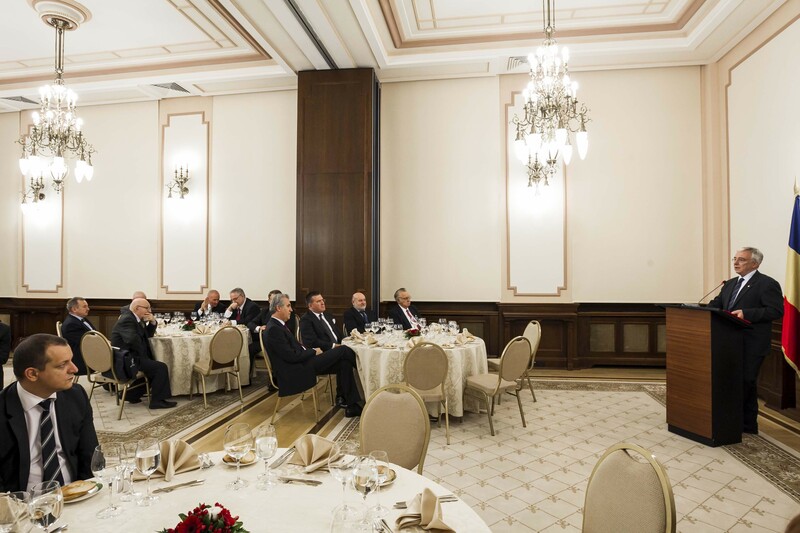 As per annual tradition, the National Bank of Romania hosted the reunion of the ARCoR members, on the 11th of December 2014. The event marked the end of yet another year of intense activity and provided the opportunity for a recap of objectives and focus, for both 2014 and 2015. A very lively evening, with many information to share and engaging discussions on several aspects, related to the values of the Club and the local activity. On such occasion, the festivity was opened by the Executive Director of ARCoR, Mugur Tolici, who quoted organizational aspects and budget management issues. He also noted the donations made by various members of ARCoR, meant to finance local publications and activities, announcing the surplus that will be available for 2015. President of ARCoR and the host of the evening, Mugur Isărescu, delivered a thorough analysis of the international events that marked 2014, with a focus on finance and economy, without losing sight of the recent global developments. The evening went on with a presentation prepared by the Secretary General of ARCoR, Liviu Tudor. He talked about the events organized in 2014, the echoes, the outcomes, the launch of the new site of the Romanian Chapter, the launch of the 33rd report to the Club of Rome in Romanian, the development of BALANCE, a Club of Rome Magazine and about the projects of the Tudor Foundation, focusing on environment and education. He also invited the members of ARCoR to help develop the online platform, thanking them for their contribution to the new magazine and for their future involvement in writing new editorials and analyses for www.clubofrome.ro. Following his participation as a keynote speaker at the Romanian TED conferences, Prof. Dr. Acad. Solomon Marcus reminded once again of the importance of education and talked about the special skills of the young generation, with an emphasis on technology and online communication. He stressed upon the meaning of values and the necessity to bestow them on the next generation, noting several sideslips of the current society. Inspired by his topics, Mr. Remus Pricopie, a young former Minister of Education, spoke about the importance of the Club of Rome values for his personal career and development. He also noted that it might be a valuable path for ARCoR to consider the development of a special organization dedicated to young members who aspire to learn and develop under the umbrella of CoR. Also Acad. Cristian Hera intervened briefly for a moment of sharp epigram in the spirit of the moment. Mr. Virgiliu Stoenescu went on to talk about futurology and scientific ways of predicting the future in finance and foreign affairs, quoting predecessors that have made history in this field, one of the pillars of the Club of Rome as seen by its founder, Aurelio Peccei. The first futurology conference, organized in Romania in 1972, was also reminded as one of the milestones by the President of ARCoR. The Governor of the National Bank of Romania moderated the discussions and drew the conclusions of the evening, which ended with a formal dinner.